Gram flour sautéed in ghee mixed with almonds and shaped into laddoos. Besan ke laddoos are made by roasting gram flour along with a generous amount of ghee - just the aroma that comes from this process is enough to create a big appetite. Crunchy almonds added to this mixture and then shaped into laddoos. 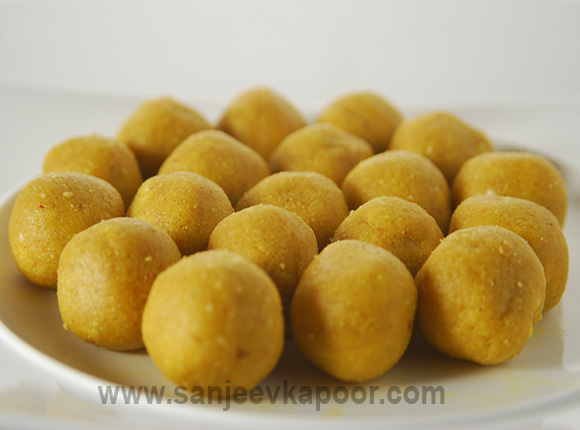 Perfect for any occasion – besan ke laddoos are one of the most favourite Indian mithais. Heat ghee in a kadai and add green cardamom powder. Add gram flour and roast on low heat till a nice aroma is given out - for approximately ten minutes. Crush almonds. Transfer roasted gram flour to a bowl and add crushed almonds and mix. Allow the mixture to cool slightly before adding powdered sugar. Add sugar and mix. Roll into even sized laddoos. Cool and store.